A first phase where there is the production of a critical mass of information into the system i.e. a hypertext accessible to all members of the learning community. A second step where students are encouraged to link similar concepts. A third phase where students should sustain the important consideration of the work produced by other members of the community. These strategies lead to a deeper immersion in the treated subject, better subjective perception of efficiency, and a somewhat increased learning progression. We focused on the performance of two classes exposed to the same educational concepts but in different scenarios. A regular high school class accomplished their tasks in a conventional learning unit, while a vocational high school class utilized a collaborative hypertext (Swiki). The two groups showed a similar increase in factual knowledge, which clearly shows an experimentation effect. Given the elective Swiss school system, regular high school students would be expected to show a better academic performance than the vocational students, in a comparable learning situation. The vocational class produced a longer and more complex hypertext than the regular class. However, the regular class produced summaries about a wider variety of subjects and showed a better confidence in their knowledge about the subjects. 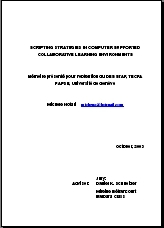 We called our scenarios: Action Based, Hypertext-Constructive, Computer Supported Collaborative Learning units (ABAHCOCOSUCOL) and found numerous possibilities for applying the scripting elements combined with the additional tool to all sorts of learning environments. This may include a face to face learning environment, but also blended learning (with adolescent and adult students), and learning that integrates different subjects. Beat war Co-Leiter des ICT-Kompetenzzentrums TOP während er Diese Diplomarbeit ins Biblionetz aufgenommen hat. Die bisher letzte Bearbeitung erfolgte während seiner Zeit am Institut für Medien und Schule. Beat besitzt kein physisches, aber ein digitales Exemplar. Eine digitale Version ist auf dem Internet verfügbar (s.o.). Es gibt bisher nur wenige Objekte im Biblionetz, die dieses Werk zitieren.